This is one of our favorite new items! Carry your bottle with you nice and safe with this natural Hemp Strap Wrist Sling. Clips on quickly and easily with our amazingly strong mini-carabiner. 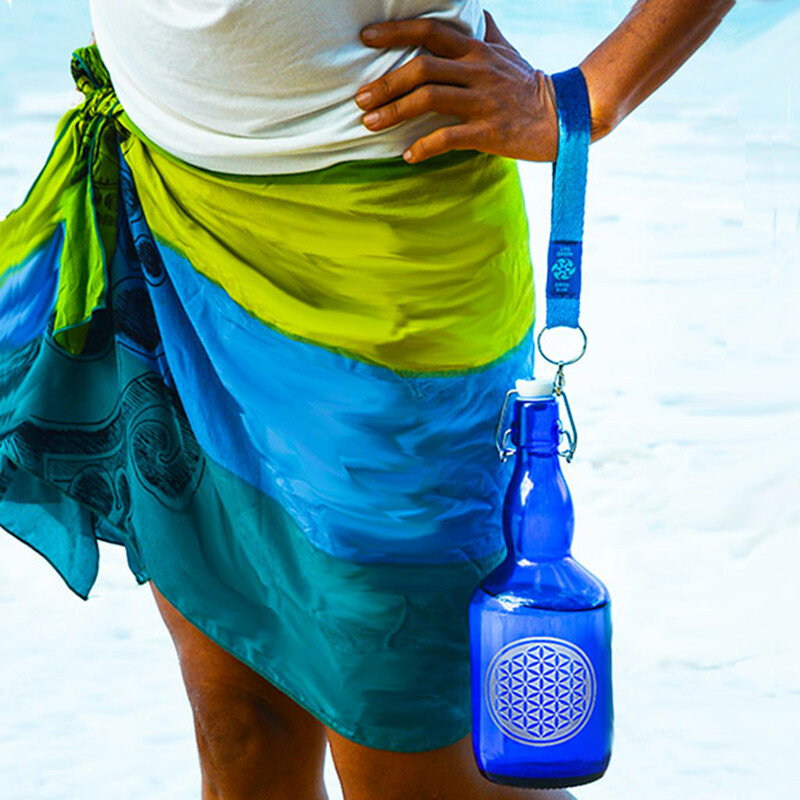 You can use the strap as your keyring and bottle carrier or exclusively to carry your bottle. We just started Dyeing them!! Made exclusively in Maui, Hawaii, hand-dyed in small batches with cool colors that flow well with Blue Bottle Love water bottles…all shades of blues and purples, and we have recently added some new colors!! Kiwi Green, Turquoise, Fuchsia (pink) with Blues……blended in fun combinations! Each piece is unique and no two alike, but of course similar, in the tie-dye way. If you see any colors you LOVE in the little video below, add a note to specify your preference! These straps will fit ALL of the Blue Bottle Love bottles with flip top lids. Just clip it on quickly and easily and it stays on until you want to take it off! Make sure you always have your keys and water with you by adding your keys to the split ring. You can then unclip to use your keys to drive, and then clip back on when you go walking or wherever you are going! Why do we make such simple water bottle carriers that do not cover up the bottle? Well first of all…it is really inspiring to be able to see the beauty of these bottles in action and especially around sunlight! And yes, sunlight…by keeping the bottle exposed, then there is even more information from the sun being absorbed by the water. Another great reason, is that the bottles are very thick and somewhat difficult to break. Using a simple strap like this will help you carry the bottle easily, but also keeps your attention and awareness on your water and your actions, which is only a good thing! Carrying the bottle on your wrist allows you to carry other things without worrying that you will drop the bottle! Hemp is machine washable too! Please note, the natural ones offered are of a different quality Hemp…more Raw, than the Color-Infused Hemp which becomes extremely SOFT and very nice to the touch.